It’s the middle of October, and in the flat track roller derby world, that means it’s time for the men to take center stage at the MRDA Championships. This year’s tournament has been dubbed the Lone Star Showdown and is taking place at the home of Texas Men’s Roller Derby in the suburbs of Fort Worth, Texas. The top-seeded St. Louis GateKeepers enter as the defending champions after their epic upset victory in the final over outgoing three-time champs and incoming 2-seed Your Mom Men’s Roller Derby. Host Texas enters seeded 3rd. The rest of the field was seeded based on the latest MRDA rankings table, with every team in the top ten accepting their invitations to play. Astute followers of men’s roller derby might have noticed something was missing from the competitive calendar this year. 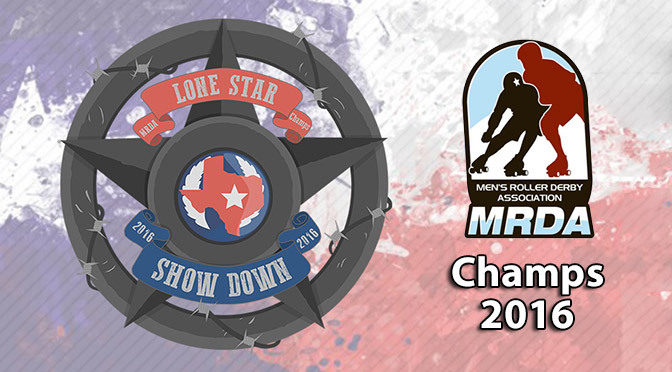 During Champs last year, the MRDA publicly announced its intentions to create a playoff season of its own. It was to consist of two tournaments in North America and one in Europe, with the top finishers advancing to Championships 2016. Obviously, these did not take place. Our requests to the MRDA for an explanation on why the playoffs plug was pulled—and without any similarly public comment on the matter—were not responded to. However, multiple sources confirmed to RDN that the quiet shelving of the expanded MRDA postseason, at least for this year, was likely attributable to a lack of credible bids to host the playoff tournaments. Hopefully, we’ll hear more about this sometime during the weekend, and if this proposed playoff format will get off the ground next year. With 66 member leagues, the MRDA is plenty big enough to support a postseason. Will 2017 be the year it finally happens? Fans playing the home game will be able to see all the games on the YouTube livestream, which will also be made available through the MRDA’s spiffy new website. The first game is bright and early at Saturday at 9 a.m. CT, with the championship final scheduled for 7 p.m. CT on Sunday. 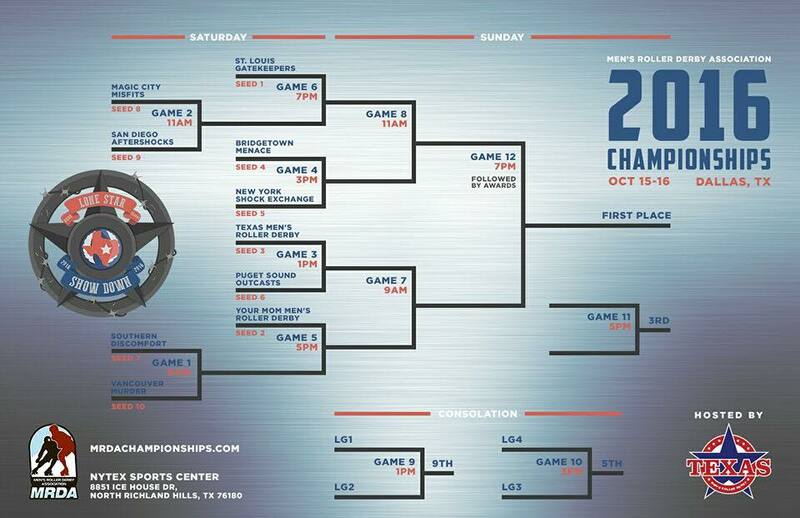 Here’s the official bracket and full weekend schedule, followed by our capsule previews for all ten teams. First Game: Magic City/San Diego Winner, Saturday 7 p.m. In the semis, they could face New York in a rematch from Sibling Rivalry. As ever, the Shock Exchange played the GateKeepers in a close one, but St. Louis won 146-111. This was the closest GK game of the regular season, and the only one where an opponent was able to keep the losing margin to under 100 points. The second-closest game St. Louis played was against Bridgetown, their other potential semis opponent. At The Big O, Portland’s team lost by 108. A few weeks later, they played an exhibition game at home against USA Men’s Roller Derby, with USARD winning that game 211-61. The focus for St. Louis will be all about making sure they play to their level in their second game to secure a trip to the final. They’re a heavy favorite to do so. First Game: Southern Discomfort/Vancouver Winner, Saturday 5 p.m. The biggest news that came out of Your Mom this year2*uncontrollably giggles* didn’t originate on the track. It came in the form of a novel of post on the YMMD Facebook page, where the team defended themselves from Transfergate-esque roster policies and the makeup of their squad for the regular season vs. Champs. Very, very long story short, the team feels as if it’s getting blackballed a little bit in scheduling because of its roster practices, even though it is not violating MRDA sanctioning requirements. Regardless of what the team feels about the situation, the fact is that Your Mom has only played five games against four very low-level opponents this year; the average score of the five was 405-40. For all intents and purposes, YMMD comes into Champs with pretty much no meaningful games played since this same tournament in 2015. The level of talent on the team is unquestionably high, possibly the highest in the MRDA if we’re talking about raw skill. But roller derby is a team sport, and if the team doesn’t have much time to be one—for whatever reason, justified or not—that’s a disadvantage no matter how you look at it. That may have cost Your Mom the title last season. We’ll see how the team does this year, with much more stacked against them. First Game: Puget Sound, Saturday 1 p.m. The hosts are in a good spot, as tournament hosts usually are. Besides all the advantages of playing at home, Texas also has the advantage of having already played their first opponent. It’s quite the big one, too. On the last day of The Big O, Texas beat Puget Sound 278-75. Texas coming up on the short end of the rematch seems unlikely. But check out the results of the team’s other two games, both wins, from the Big O. One 216-122 over #4 Bridgetown, which is a handy result to have pocketed in case the two meet in the third place game. The other was a 282-213 win over #9 San Diego. A 3/9 seed matchup in the MRDA finishing as close as 69 points is an eyebrow raiser if you’re the 3 seed. The question surrounding Texas is if it can break through to the final against (assuming) St. Louis, or if they’ll be back in the third place game gunning for bronze. Since the merger of Dallas and Denton, Texas Men’s has emerged as a major player in the MRDA, and a win over Your Mom in the semis would cement that status even future. First Game: New York, Saturday 3 p.m. The Menace will face the Shock Exchange on day 1 of the tournament, and like many other teams in the small world of the MRDA, they’ve faced them before earlier in the 2016 non-tournament season. In New York just two months ago, Bridgetown defeated NYSE 152-107. Portland’s men’s team is expected to do much better at Champs this year, after coming in a low seed and playing their way into a quarterfinals loss against the GateKeepers in 2015. As we mentioned before, Bridgetown was able to keep the score difference respectable against St. Louis in their game this year (108 point loss at The Big O), though still not realistically close enough to make a game out of it. Still, they’re knocking of about 40 points of deficit every time they play the Keepers. Bridgetown will want to see if they can keep trend going, as well as one other. Two years ago, they went 0-2. Last year, 1-1. If they can get two wins this year, they’ll have a bronze medal to show for it. First Game: Bridgetown, Saturday 3 p.m.
What happened to New York? Before Your Mom hit the town3*more uncontrollable giggles*, NYSE was the undisputed King of the MRDA. Now they’re more like a bishop: Still pretty powerful, but there are more valuable pieces on the board. Last year, they didn’t even medal, which was hard to believe. The Shock Exchange have got to feel that the time is now to rebound. Their very competitive game against St. Louis this year signaled that the team hasn’t gone anywhere. A big win over Puget Sound at Sibling Rivalry, 245-98, is a reminder that there’s still a big difference between a good team and a great team in the MRDA, of which NYSE still can be called the latter. There’s only the matter of the 4/5 game against Bridgetown, and that pesky previous result that must label NYSE as a moderate underdog. That’s not a role we’re used to seeing one derby’s O.G. men’s leagues take on. First Game: Texas, Saturday 1 p.m.
Puget Sound has long been a team stuck in the middle of the MRDA top ten. Since their second place finish at championships 2011, the best the Outcast could manage was a 4th place finish at home in 2014. They’ve been outside of the competition for a medal more often than not. Seattle hasn’t had much in the way of a competitive schedule this year. The team’s two closest games finished with a 147 point margin. both at Sibling Rivalry. One was a win against Magic City (269-122), the other was a loss against New York (245-98). Earlier in the season at The Big O, they lost to the Champs by a similar margin, with St. Louis taking the 240-75 victory. First Game: Vancouver, Saturday 9 a.m. The Londoners are back in the United States for their third appearance at the MRDA Championships. Last year, they were seeded 6th, which never gave them the opportunity to face a lower-ranked team. It showed, with SoDisco going 0-2. This year they come into the tournament seeded a bit lower, but in a much better position to make a better showing. Not just by being the top seed in the two early Saturday play-in games, either. The team has a also been playing well as of late. Flat Track Stats puts Southern Discomfort as the second-best team in all of the MRDA, virtually tied on FTS ranking points with Your Mom. If the Knights can win on Saturday morning, that will setup an intriguing matchup with YMMD later in the day. First Game: San Diego, Saturday 11 a.m.
Magic City has been reemerging after a period of instability a few years ago, returning to MRDA Championships last year with a 1-1 record after missing out altogether in 2014. If MCM wins their first game against San Diego, that record is pretty much guaranteed to repeat itself this year. St. Louis awaits the winner of their matchup, and the Misfits have played them before. It didn’t go well: The 237-36 loss was the worst of Magic City’s season. The best result of their season came in an unsanctioned game against a fellow champs participant, though not from the men’s side. Way back in February, Magic City played against their WFTDA stablemates Jacksonville. The boys came out with a 145-138 victory. First Game: Magic City, Saturday 11 a.m. It only took San Diego a year of MRDA membership to make it to the championship tournament. They didn’t win a game, but they certainly made an impact rising up so quickly. It probably didn’t hurt that this was around the same time that USA Roller Derby player and San Diego native B.Stang started playing at home instead of flying out to Des Moines to play with YMMD. Still, you need 13 other guys to make a team. Their resolve will be tested, after having gone through tragedy earlier this year. A freak crash involving an airplane on a freeway killed a member of the extended Aftershocks family and severely injured several others as the team was driving up to a tournament in Los Angeles. …but that's a in flux a bit at the moment. Some SDRD personnel were involved in a bad car accident on their way up. We hope they're OK.
San Diego played on that weekend, but didn’t get a full slate of games for obvious reasons. They made up with that with four games at The Big O, three of them against other MRDA Champs entrants. Their only win on that weekend was against #21 Twin Cities, 319-178. Both of the Aftershocks’ games at champs last year were very close, and also very winnable. They’d like to be able to take home a win at Champs this year. If they don’t, you can be assured that at least their games will be among the most entertaining and competitive on the weekend. First Game: Southern Discomfort, Saturday 9 a.m.
Western Canada’s finest make their first MRDA Championships appearance after going undefeated through the year. None of those wins were particularly competitive—their smallest margin of victory was against the #12 Philly Hooligans in a 219-105 game two months ago. No matter. With how the rankings played out, they beat the teams they needed to beat (average opponent rank: 26), by impressive enough margins (average victory: 226 points) to squeak into the top ten. Vancouver’s appearance at Champs will make for a historic first in men’s flat track play. Their first game against Southern Discomfort will be the first MRDA tournament game where both teams are based outside of the United States. If we get those MRDA playoffs we were promised in 2017, we might see yet another milestone: A tournament in Europe where they all are. But you gotta start somewhere, right?